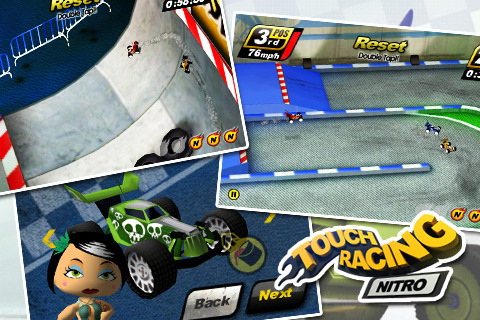 I recently took a break from my iPad and played a game by Bravo Games called Touch Racing Nitro (Opens App Store). The game is a RC racing game, in which users race one of twelve cars around 18 different tracks. The thing that makes this game stand out is its controls. The controls are completely touch based: the car follows your finger. Because of this feature, gamers either love or hate this game (see the video below). Tapping once on the screen causes you to use your nitro, speeding you up and causing to either race ahead or be flung off the track, inevitably losing the race. I found that the reset button which you must double tap to be very unresponsive at times, and even not working. You must be going the wrong way or off the track to reset, but the game doesn’t always realize that you are off the track, especially if you are just stuck on the railing. Although, once I saw the video below, I got the hang of the controls, and started winning races, and never leaving the track. The game includes 2 modes, tournament, where the player can race AI opponents, and Time Trial mode, where you play on any track you’ve unlocked and see how fast you can go. There is no online leader board, or any online integration at all, so you must race your ghost around the track in time trial mode. The game has a larger price tag ($3.99 on the App Store), especially when considering the lack of online integration and the price of other games in this category. It is a really fun game to play though, and has a tremendous replay value. If this game ever gets online integration, I would buy it in a heartbeat, but I would still recommend this app as is. UPDATE: The developers released an update, giving the game a 1 touch reset button, a restart race in the pause menu, new tracts and, most importantly, OpenFeint integration. The app is still 3.99, but now is one of, if not the, best racing game for the iPhone once the learning curve is passed.